The fit ruck convertible backpack is as a high-quality ballistic nylon rucksack with comfortable padded shoulder straps and back area along with six easy-grip rubber handles arranged on all four sides that allows you to quickly convert the fit ruck into a super-sandbag training tool. This 20 lb. fit ruck & Sandberg sandbag training package consists of a fit ruck and two empty Sand Bells; (1) 12 lb. and (1) 8 lb. Inside, the fit ruck has a large interior compartment with pouches that can hold the filled Sand Bells. With a capacity of 2,400 cubic inches, it is also perfect for stowing other portable exercise equipment such as the Hyperwear Steelhead or Sand Rope free weights and can hold a maximum capacity of 60 lbs. of weight. Create your desired load and start your workout by rucking outdoors. Next, convert your fit ruck into the ultimate training sandbag by detaching and stowing the shoulder straps and cinching up the side straps. 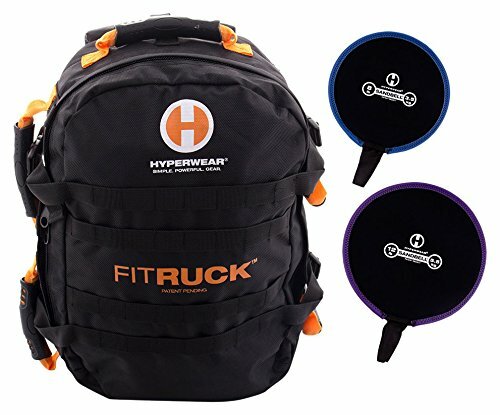 Your fit ruck is now a super single heavy sandbag that can be used for all manner of exercises like shouldering, loaded squats, swings, presses, windmills, thrusters, weighted carries and much more. When the fit ruck is loaded with sufficient weight it can also act as an anchor for a Sand Rope or resistance band. Perform exercises such as chest press, flys, rows, kickbacks, chops and more by simply weaving the tubing through one of six handles. When done simply roll the band neatly inside the fit ruck, and zip it up to stow for your next workout. A water bladder compartment (bladder not included) and tube opening makes it the perfect rucking backpack. It also doubles as a gym bag and gear bag for day-to-day use. US patent 8,622,877 B2 and other patents pending. Fit ruck is a registered trademark. You are Buying the strength package with two Hyperwear Sand Bell filler bags included of 8 lb. and 12 lb. for a total of 20 lbs.